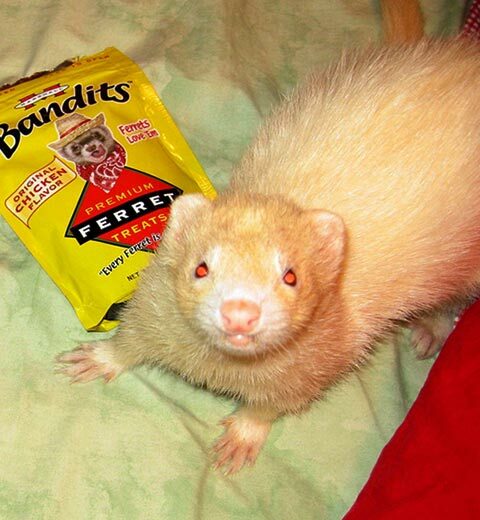 Bea, a very lucky ferret! 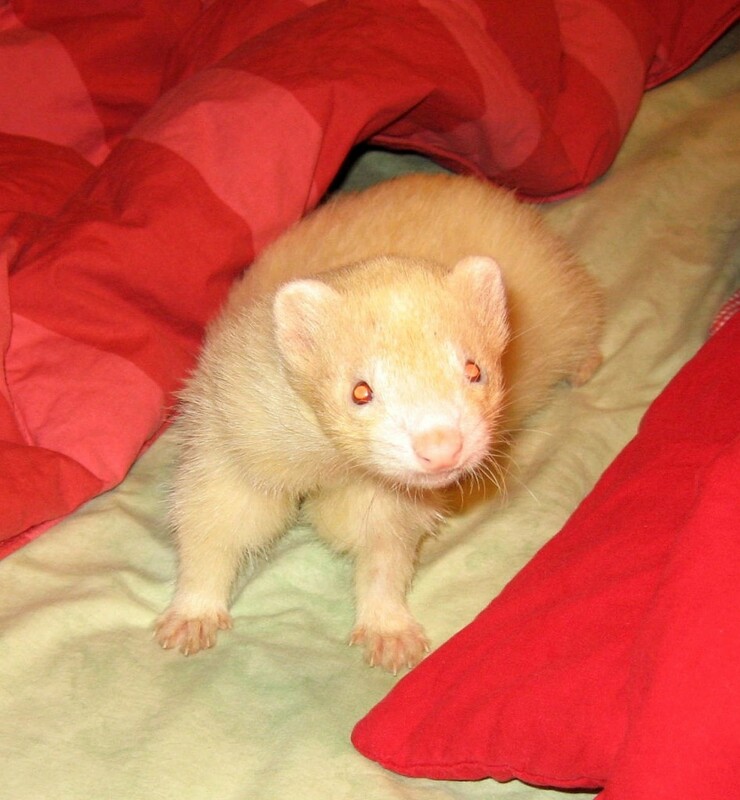 Bea, a four year old female spayed ferret, presented on emergency when she collapsed after a traumatic fall. She had been playing with her owner and accidently fell to the floor. On physical exam, Bea was unresponsive, hyperventilating and not able to move. Her body temperature was sub-normal at 96.1°F, she had a very pale bluish pallor, shallow rapid breathing and an elevated heart rate. 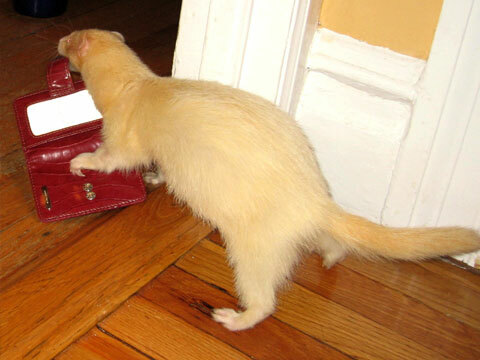 Her abdomen also felt slightly distended, although Bea has a history of a large spleen which can be normal for ferrets. The team of doctors and nurses at the Center for Avian and Exotic Medicine quickly recognized that Bea needed emergency supportive stabilization. Bea was placed in 100% oxygen and she was put on a forced hot air blanket. Her vital signs were carefully monitored via a blood pressure machine and her oxygen levels were measured using a pulse oxymeter. An IV catheter was placed in her front arm to deliver an IV bolus of fluids for shock, and she was maintained on a steady infusion of IV fluids to slowly increase her blood pressure. Bea was treated with opioid pain medication as well as steroids which can help patients in shock. At this point, her pulse felt slightly stronger and she was deemed stable for diagnostics to be performed in order to find out why she had collapsed. Bea was taken to radiology for chest and abdominal x-rays and a small blood sample was taken to check her organ function and blood cell counts. The x-rays revealed a slight loss of detail in the borders of her spleen but no broken bones or obvious injuries were visible. Her blood tests showed that she was in shock, anemic, had a mild decrease in kidney function, and low blood protein values. The doctors diagnosed that Bea was in circulatory shock and that she was suffering from internal hemorrhage (bleeding). She was given a dose of iron, gastro-protectants, and antibiotics. After 4 hours of intensive care and monitoring, Bea started showing mild signs of improvement. Her pallor was now a pale pink. Her breathing was improved and she appeared more comfortable. Bea was able to sit up and stand slowly and she was taking small amounts of liquid food. Overnight, the night nurse continued to monitor her vital signs and Bea steadily gained her strength. The next morning, everybody was thrilled to see that her color was visibly more pink. Her blood concentration was re-checked and it did show a persistent severe anemia. When a pet suffers blood loss, it takes about 24 hours for the blood concentration levels to fall as the body adjusts to the loss of blood volume. We had expected to see this drop in blood concentration, and it further supported our diagnosis of internal bleeding. A repeat x-ray showed mild ascites, or free fluid in the abdomen, as well as a continued blurring of splenic margins. At this point we were highly suspicious of splenic bleeding. An abdominal ultrasound was subsequently performed, and this confirmed a diagnosis of abdominal bleeding with splenic hemorrhage and hematomas. A fine needle aspirate of the fluid in her abdomen showed that the ascites was blood. However, we had good news in that there were clots which had formed on her spleen suggesting that the bleeding had stopped. A blood test called a reticulocyte count was performed next to make sure Bea was able to produce new red blood cells to replace the ones that she had lost. The test results also brought more good news showing that her body was producing new blood cells normally. Bea continued to gain her strength and was discharged to her dedicated owners after 3 days in the hospital. At her recheck 1 week later, Bea was doing very well; she was back to her normal cheerful and playful self. All the staff at the Center for Avian and Exotic medicine wishes her well and are very happy for her complete recovery!